Swedish 830 Standard Silver ball footed beaker date marked for 1907, maker's marks JAO. The matter finished body has an applied crowned red enamel stag crest surrounded by an oval cartouche decorated with scroll work engravings. The interior, yop and bottom rims are gilt. One of the ball feet has dents and the feet are slightly ushed up into the base. Weighing 103 grams or 3.3 ozs. Troy, this impressive and desiraqble beaker is 4 1/4" tall, 3 1/8" in diameter at the top rim and 2 1/8" in diameter ant the base. 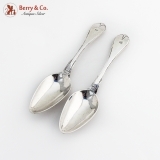 Swedish Small Tablespoons Pair I. H. Leffler Coin Silver 1825 Date Mark. There is an engraved monogram "BL" on the back of the handles and mark "MT" on the front. These glorious spoons are 8 3/8" long. Total weight is 125.7 grams or 4 Ozs. Troy. Vintage Gravy Ladle Gilt Bowl Swedish 830 Standard Silver 1927 Date Mark. This handsome ladle is 7 7/8" long and weighs 54.8 grams or 1.8 Ozs. Troy. 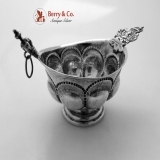 Swedish 830 standard silver gravy boat in an early Baroque design, maker′s mark J(? )R, Stockholm, c.1750. 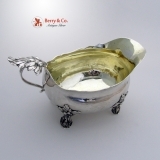 This early, ornate gravy boat has a large, cast applied leaf and blossom thumbpiece on a strap handle ans a large, bellied body with a scalloped edge rim, sitting on four conforming open work scroll feet. Weighing 239 grams or 7.7 ozs. Troy, this desirable gravy boat retains its original fire gilt interior and id 7 3/8" from handle to spout, 3 1/2" wide and 5" tall to the tip of the handle. Save for the few expected marks: The soft, warm, original finish is present, with no buffing or machine polishing. The excellent original condition and clear, crisp detail, with no monograms, removals, repairs or alterations, make this an especially attractive offering. Swedish 18th Century serving spoon, c.1790 with a parcel gilt and an engraved bowl and an unusual finial having a scepter 4 cross knop with each cross having a rope twist ring and there is a rope twist ring finial. All original with no repairs, retaining most of the original fire gilding. This unusual spoon is 7 1/8" long and weighs 34 grams. Monogrammed as described above, the soft, warm, original finish is present, with no buffing or machine polishing. The excellent original condition and clear detail, with no removals, repairs or alterations, make this an especially attractive offering. 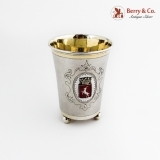 Swedish 830 standard silver punch cup date marked for 1711, maker′s mark IL. The scroll handle has a central medallion of a helmeted warrior and a crown finial. The other side of the cup has a crown shaped knob with a ring for hanging the cup on the side of the punch bowl. This beautiful cup is 5 1/8" long, 2 1/2" tall and weighs 60 grams or 1.9 ozs Troy. The very good original condition and clear, crisp detail, with no monograms, removals, repairs or alterations, make this an especially attractive offering. The soft, warm, original finish is present, with no buffing or machine polishing. Swedish early 19th Century punch ladle with an Ebony handle, date marked Z2 for 1806, makerâ€²s mark EAK. The town mark, as pictured, is not known. An unusual oval pan shaped bowl with a later presentation inscription that translates to: Bequest from Fornby Stora Tuna. It also has an early monogram TGL(Z). This was likely taken to America by a late 19th C. Swedish immigrant as a precious object from home. 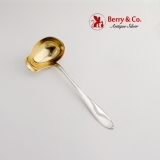 This special ladle is 15 1/2 " long, with a side spouted bowl 4 1/2" wide. The ladle weighs 132 grams or 4.2 ozs. Troy with the wooden handle. 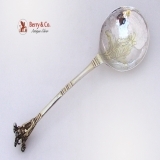 The silver is of good gauge and the engraved handle attachment point at the bowl is clean and repair free. Inscribed and monogrammed as described above, the soft, warm, original finish is present, with no buffing or machine polishing. The excellent original condition and clear detail, with no removals, repairs or alterations, make this an especially attractive offering.